However, moving from one application to another, or one satellite transponder frequency band to another, has previously required operators to use multiple antennas. Thanks to great new innovations, many antennas now offer multi-band and multi-application operations—thus, two or more antennas become one. With multi-band enabled antenna operations, weather conditions and transponder capacities are less of a limiting factor. An operator can simply swap RF kits and point the antenna to a different satellite within minutes. This is extremely useful when traveling between multiple satellite footprints, networks, and to take advantage of lower cost, higher throughput services. Versatility with satellite communications is increasingly becoming a mandate for government and emergency response applications. National agencies such as FEMA, small or local government agencies such as police and fire, and emergency response agencies such as the American Red Cross, all run head-first into environments with challenging conditions—floods, hurricanes and catastrophic events, to name but a few. The locations vary widely and are often in remote areas. Responders often have the same issues as broadcasters with weather conditions, satellite transponder capacity and costs. Many of these agencies have a different approach to satellite communications. Instead of driving to an emergency with a vehicle-mount antenna, they may fly in with a case-based transportable antenna. This adds even more versatility as agencies can restore communications with very small, compact antennas that can be shipped or flown to any location. Multi-band, auto-acquire antennas from AvL Technologies can be assembled and operating within minutes. An example of this is AvL Technologies’ new family of Integrated Terminals, or FIT antennas, which were designed specifically for this type of application. The antennas come in multiple sizes—.75, .98 and 1.35 meter. These antennas all pack into two rugged cases and can be assembled by one person in 10 minutes or less, and users can then be on air quickly, thanks to AvL’s AAQ SatCAP assisted pointing, or the AvL AAQ antenna control system. Because the FIT antennas are multi-band, an antenna can be switched from Ku- to Ka- (or vice versa) operation with the twist of the feed and four latches holding the RF kit behind the reflector—this frequency band change only takes about 30 seconds to perform. The US Department of Defense (DoD) has broad ranging needs for satellite communications — multiple bands, very high throughput requirements and ultra-rugged equipment. The men and women serving in the military work in environments so challenging that their duties can be hard to imagine, yet the communications teams are responsible for keeping lines open when lives are on the line. For many years, military agencies have been carrying small flyaway antennas into danger zones to send and receive data from thousands of miles away. 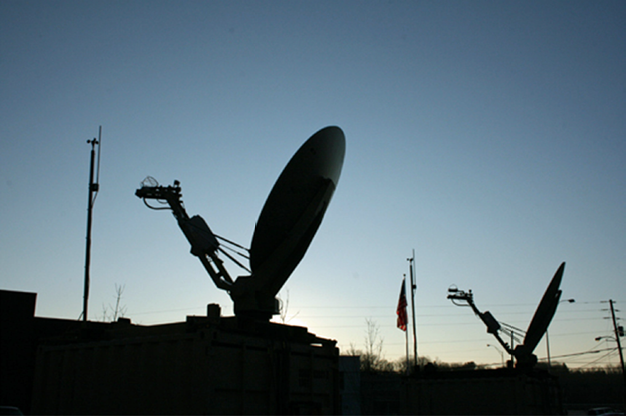 With the magic of satellite communications, this data can be transmitted up to a satellite — from the US, from a forward operating base, or from an unmanned vehicle—then received by troops anywhere in the world. Flyaway antennas can have swappable feed and RF systems to enable the data to be transmitted and received by multiple networks, and switching from one network to another takes mere minutes. 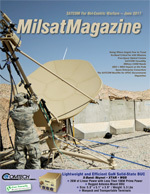 In recent years, the military has recognized the benefits of multi-band and multi-application satellite communications in larger packages. An example of this is a 4.6 meter flyaway antenna developed by AvL for a US DoD customer. The antenna is unique in that it packs into cases that qualify for commercial air freight so they do not require expensive military airlift. Each case meets standard man-lift requirements, with the heaviest cases being four-man-lift—no forklift required. Once cases are positioned, a standard AvL 4.6 meter antenna can be assembled in 90 minutes by a crew of three and the antenna can be on-air minutes later. The axi-symmetric design of the 4.6 meter reflector enables feeds to be swapped through the back side of the center hub of the reflector without disengaging the elevation system. For those who have used 4+ meter class antennas, this is a huge improvement in design. The antenna operates in C-LP, C-CP, Ku-LP, DBS-LP, Ka-CP, Ka-LP, X-CP, and feeds can be swapped out in roughly 10 to 15 minutes with a two person crew, making this 4.6 meter antenna the equivalent of seven antennas in one. Another new and unique antenna designed by AvL for a US DoD customer is a 5.0 meter fixed Earth station (see photo on the previous page) with a rotary multi-feed system. The antenna was designed to operate with a host of band options: L-CP, S-CP, C-LP, C-CP, X-CP, Ku-LP, Ku-CP, Ka-LP, Ka-CP. The feed system can hold as many as six feeds simultaneously and is motorized to enable the operator to change feeds with one click, and to also reposition the antenna to point to a different satellite just as easily. A really complex option occasionally employed by military agencies is simultaneous dual-band. Antennas using simultaneous feed systems—typically X- and Ka-bands—require rugged positioners that can manage significantly more weight on the feed boom than is necessary for a single band antenna. Simultaneous feeds require multiple wave guides, separate amplifiers, separate filters and separate LNBs, and this dual equipment can be bulky and heavy. Simultaneous operation also has a drawback—signal degradation. A simultaneous system increases operational capability, but also prohibits optimal operation for both bands due to interference and signal mingling. For these reasons, military agencies with significant resources occasionally operate with simultaneous bands; however, finding a reasonably priced or high performing simultaneous system for commercial operations is unlikely. For years, broadcasters have mounted multiple antennas onto the tops of large trucks. 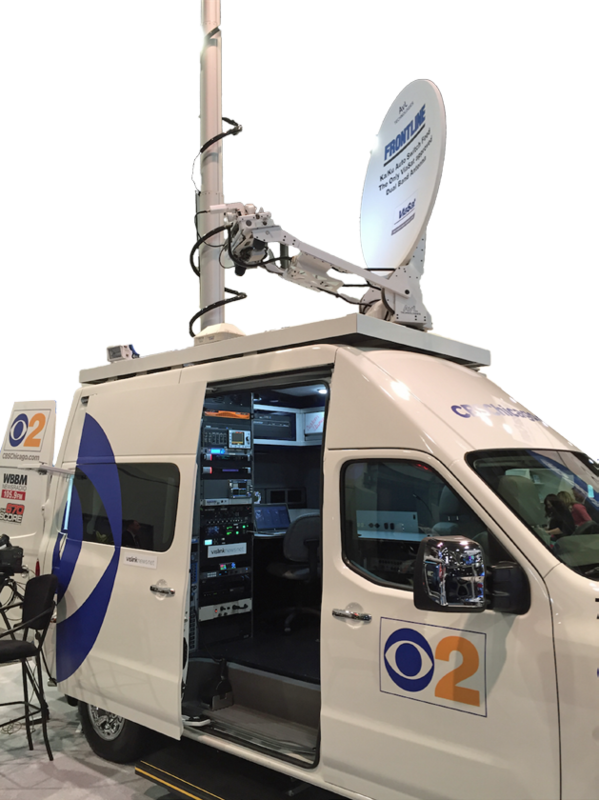 These trucks often have big—2.4 meter or larger—C-band antennas as well as a smaller—typically 1.2 meter—antennas for Ku-band to take advantage of multiple, competing network providers and lower uplink costs. Large antennas with big amplifiers can often overcome issues with weather but power limitations enforced by the FCC to avoid adjacent satellite interference may be yet another limiting factor. Some trucks also have smaller receive-only antennas and microwave masts for terrestrial point-to-point connections. All of these roof-mounted devices require SNG truck manufacturers such as Frontline Communications to reinforce for structural integrity, while maintaining ample room for amplifiers, modems and other equipment for operating simultaneously on different networks. Newer, multi-band antennas with motorized feed selection have enabled the use of smaller vehicles such as crossovers, SUVs and transit vans to operate at Ku- or Ka-band frequencies with a single 1.2 meter antenna. An example of this in operation is Frontline Communications’ Chevy Traverse, Chevy Suburban, Ford Expedition, Ford Transit and Nissan NV platforms. These vehicles offer ample room for multiple equipment racks, camera and tripod storage, and numerous generator options. These platforms also have one 1.2 meter Ku-/Ka- antenna that can move from one service provider/satellite network to another with the push of a button. Antennas with manually swappable feeds have been available for years. Climbing on top of a vehicle is always dangerous. Add inclement weather and those risks increase dramatically. An antenna with motorized feed selection enables the operator to stay in a safe place—inside the vehicle—and change bands with the simple push of a switch. Another new innovation is the pairing of multi-band antennas with the tracking capabilities to communicate with satellites in different orbits. An example of this is an AvL antenna system designed and built for SES and O3b. AvL and O3b have collaborated for several years on Ka-band antenna systems that track O3b’s MEO satellite. These antennas operate in tandem pairs with make-before-break communications similar to talking on a cellular phone and seamlessly hopping from one tower to another while driving a car down a highway. These case-based transportable MEO tracking antenna systems are available in three sizes—85 centimeters, 1.2 and 2.4 meter—with additional sizes already in development by the company. After SES fully acquired O3b, AvL was tasked with adding Ku-band GEO operation to these antennas, which gives SES and O3b the option to use one antenna system on either network. To move from Ka- MEO to Ku- GEO, one antenna is quickly swapped to use a Ku-band feed and RF kit to operate, and the second antenna remains idle. To move back to Ka-band MEO- operation, it’s another quick swap of feeds and RF equipment, and the antennas immediately return to MEO- tracking mode. 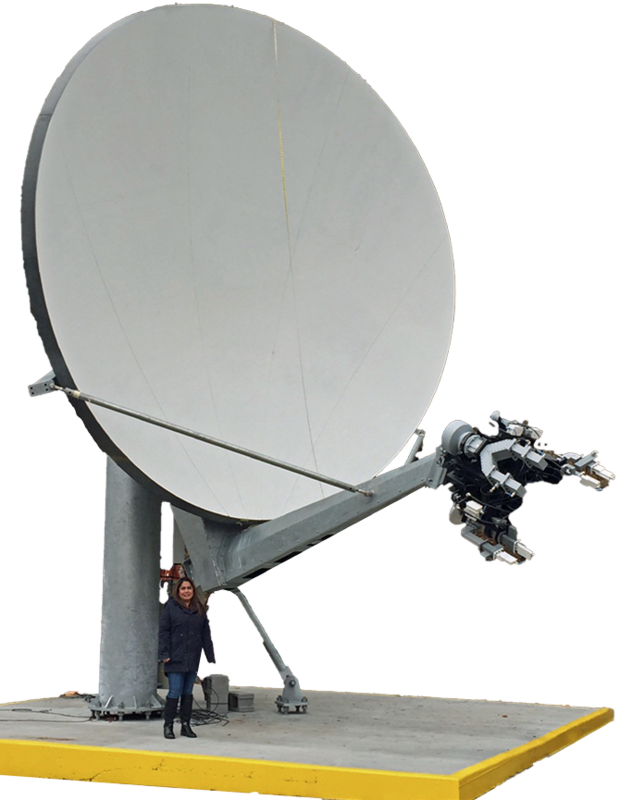 Everyone working in satellite industry knows how versatile communications can be with satellites—any location, any condition, any application. Satellites enable communications in places and situations where terrestrial systems are vulnerable or non-existent. As technologies evolve, more capabilities—and safety features—will continue to be brought to market, making satellite communications the most versatile, robust and reliable form of communications available in remote and harsh environments. Krystal Dredge is the director of marketing for AvL Technologies. Krystal has 15+ years of product marketing experience in satellite and wireless communications, and most recently worked at Honeywell and EMS Defense & Space Systems prior to joining AvL in 2012. She holds a BSJ degree in Journalism from the University of Kansas and an MBA from Wichita State University.